A while back, I was getting ready to lead a moderate day hike in Pickett State Park, in association with the Sierra Club's Fall Family Weekend. On the way to the trailhead, I made a few comments about the Ten Essentials. It was clear from the response of the group that few of them had ever heard of these critical items. After providing the group with my 10 minute canned lecture on the Ten Essentials, someone said, "Why don't you write an article?" 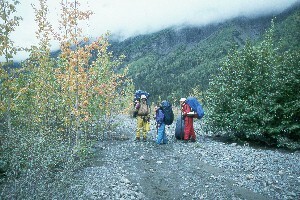 Of course, this topic has been covered in many other hiking guides and wilderness books. But, here it is anyway. Actually, much of this is excerpted from a book which the Harvey Broome Group has published on the hiking trails of the Cherokee National Forest, available at amazon.com. I can steal it because I wrote the section. With all the "excitement" that the wilderness can throw at you (weather, critters, rough terrain, accidents), it seems to be only common sense that the hiker should be ready to meet it with at least the bare minimum of equipment. This minimum is usually referred to in hiking guides as the Ten Essentials. (The exact number and composition of such a list can often consume hours of debate around the campfire, or anyplace else where hikers congregate.) Briefly, the Ten Essentials are those items that you should never leave the trailhead without. And that means NEVER! EVER! It is absolutely amazing how many hikers have heard this, and yet fail to head the advice. Why not? Laziness. Stupidity. The old "it can't happen to me" syndrome. Well, maybe not. But are you willing to bet your life on it? I personally know some folks who did, and came dangerously close to losing. The couple of pounds that the essentials represent are not "extra." They are absolutely critical. There is no way to emphasize this point too much. "OK, OK," you say. "I'll carry them - but what are they?" Again, the list will vary depending on who you talk to, but the following are some that almost everyone can agree on. With some comments. Naturally. 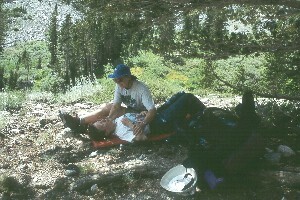 First Aid Kit The casual hiker can purchase ready made kits, or you can fabricate your own. You don't have to be prepared for cardiac bypass surgery on the trail. Keep it simple: A few bandaids, some gauze and adhesive tape, an elastic bandage for twisted knees or ankles, some butterfly bandages for deep cuts, a few antihistamines for bee stings, and some pain killers are most of what is needed for day hiking. For extended backpacking trips, you might want to add a few more things. Talk to your family doctor about which prescription medications you might want to have. Maps Many areas are covered by guidebooks. At least carry one of those with you. Better yet, carry topographical maps. You say you don't know how to read the maps? Learn. C'mon - it's not that hard. Compare a topo map to a state highway map. I'll bet I can tell you which one is more complicated. Anyway, it is really important that you have basic map reading skills. The complexity of the terrain in the many parts of the Southeastern United States is almost unbelievable. Unless you are on a very well maintained trail, it is easy to get on to a less well maintained spur, and before you know it, you are in the next valley. You can purchase topo maps from a number of hiking and hunting equipment shops in the region. You can order them from the "manufacturer," the US Geological Survey, in Denver. There are a number a digital topo map versions available, reviewed eslewhere on this web site. Compass Do not assume you can find north on a cloudy day without instrumental assistance. Yes, moss does grow on the north side of a tree. But in the near-rain forests of the Cherokee, it also grows on the south side, and the east side, etc. Look, you probably spent five or ten bucks worth of gas getting to your hike. Don't feel like you have to spend much more on a good compass. And invest ten minutes worth of your valuable time reading the material that came with it. It can be really amazing to learn how many people carry compasses and don't know how to use them. Rain Gear The comments above should have convinced you to take such, even on a bright, sunny day. But don't feel like you can't leave the trailhead without a $350 Gore-Tex rain suit. Sure, they are great, but so is any thing that will keep you dry: Garbage sacks, ponchos, coated nylon rain suits. Some hikers even carry umbrellas, just to add a touch of civility to the whole experience. And you backpackers, don't forget a cover for your pack. 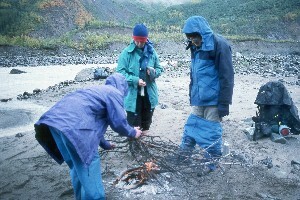 Even the coated nylon pack bags will let water seep in and dampen your sleeping bag or extra clothes. Extra Clothes, Including a Wool or PolarTek Hat You lose at least 35% of your total body heat through your head. That 35% can make a tremendous difference in cool weather. It may be the thing that keeps you alive through an unscheduled night out. But most of all, it keeps the brain warm, so that you can think your way out of any predicament in which you find yourself. Matches Get the waterproof variety, or put the regular ones in a waterproof container. Cigarette lighters are very convenient, especially for starting backpacking stoves. But try to use them after the flint has gotten wet, and you'll see why people who carry them also carry matches. And remember that starting a fire in the Cherokee can sometimes be a non-trivial matter, especially when it has been raining for a few days - or even a few hours. Don't be afraid to assist the start-up with a little toilet paper, or a few pine cones. Knife We're not talking here about the 40-tool, everything-including-the-kitchen-sink Swiss Army variety. Just a simple, one or two blades type will do. To cut fabric, shave kindling, cut some cord, etc. Flashlight This one seems to raise the most eyebrows among novice hikers. "Why do I have to take a flashlight for a day hike?" Of course, the answer is because it's only light about half of the time. Sometimes it's difficult to judge the amount of time that it will take to complete a hike. Or maybe you just want to watch the sunset from an overlook four miles up the trail. There are any number of reasons why you might be out after dark. But walking in the dark on a trail, without a light, can be a terrifying experience, especially after the fourth fall. For most situations, a small light powered by a couple of AA alkaline cells will be fine. Just make sure that the batteries are reasonably fresh, or that you're carrying spares. For extended trips, always carry a spare bulb or two. Extra Food "Extra" implies that you have some food with you to begin with. Look, we know that no one is likely to starve to death, even if you go without food for a week or two. But that extra snack bar will give your body a little charge to help keep warm on a cold day, and may help you think straight. And relax. Don't worry about nutrition. Anything that is high in carbohydrates will be fine. This is your one chance to justify all of those things that you don't eat the rest of the time because you want to stay healthy. So go ahead, pour in the Twinkies and the M&M's. This is not the time to be dieting. The Tenth Essential This is your call. Think about what might be important to you. For some, it might be strong insect repellant, for others, toilet paper, a hairbrush, make-up, or the latest Tom Clancy novel. Probably, everyone should try to take along a good load of common sense.